Most Boston neighborhoods already have the sense of place that's so important these days in attracting new residents and businesses. That's why it's important to weave a new development into its neighborhood, The Hamilton Co's president, Carl Valeri, tells us. 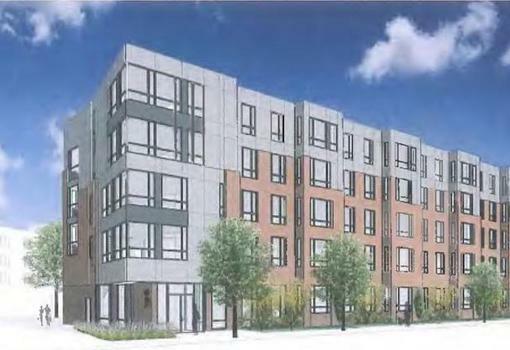 Recently The Hamilton Co started work on the 44-unit 150 Camden St in Lower Roxbury, an apartment that completes the multi-building development known as Douglass Park. "Our architects did a tremendous job to design a building that fits nicely within the framework of the surrounding area,” Carl says. 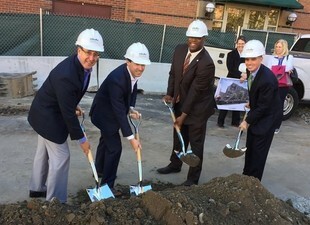 Pictured: Carl; Hamilton Co VP for development Jameson Brown; Boston City Councilor Tito Jackson; and Boston Planning and Development Agency director Brian Golden breaking ground on 150 Camden St.
Brian notes that 60,000 more residents will flood into Boston over the next decade, spurring the need for additional, market-rate, middle-income and working-class housing. David Hacin of Hacin & Associates, architects on the project, said the alternating use of brick and panel on the building “activates the façade” and allows for different views of the building from both Tremont Street and Columbus Avenue. “The design of the building picks up the rhythm and scale of nearby South End and Lower Roxbury buildings, while the brick exercises a contemporary interpretation of the mansard roof condition,” David says. The new residences are being built on the last undeveloped parcel within the Douglass Park development, which the Hamilton Co purchased in 2013 for $52M. The Park includes two other residential buildings on Columbus Avenue—one comprised of 134 apartments, the other of 33 condos. 24% of the rental units at Douglass Park are affordable.